Huber is one of the leading suppliers of high precision thermoregulation solutions in research and industry. Their products ensure precise temperature control in laboratories, pilot plants and production processes across the globe, offering temperature control solutions for applications ranging from -125C to +425C. Huber has been driving technological development and continuous innovation in the field of liquid temperature control since 1968. The introduction of Unistat technology in 1989 was a revolution in temperature control, setting industry standards for thermodynamics and accuracy. 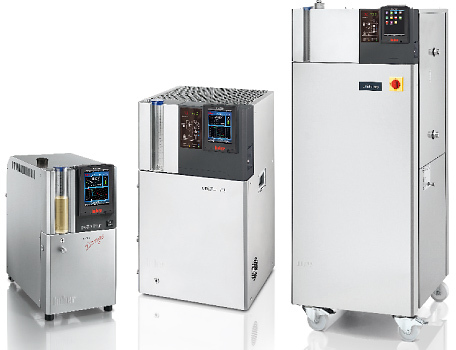 In addition to dynamic temperature control systems, Huber’s product range includes immersion coolers, heated and/or refrigerated baths and circulators, and chillers. The fundamental operational advantages of the Huber Unistat system are reduced volumes of heat transfer fluid (HTF) and high flow rates. This results in improved heat transfer, resulting in quick and precise temperature control in reaction vessels and other closed systems. The pump design, with soft start, gives the highest possible flow rates. This allows the fastest and safest possible ramp rates to protect glass-lined or glass reaction vessels. Huber manufactures three different types of controllers, which cover a range of temperature control application requirements, to suit any budget. The KISS and OLE controllers offer simple operation and OLED temperature displays, making them the first choice for routine tasks. The Pilot ONE touchscreen controller, however, is designed for more demanding applications. Huber’s ‘Plug and Play’ technology and array of professional-level features guarantees highly precise results, simplifying daily tasks without compromising performance. Thanks to Huber’s upgrade system and backwards compatibility, expanding the functionality of existing equipment is feasible at any time. Since 1989, the dynamic thermoregulation of Huber’s Unistat range has been revolutionary in terms of fluid temperature control, providing an ideal solution for precise and efficient thermal control of externally connected applications. Unistat technology offers both rapid temperature change, and a wide range of temperature control options without fluid change. With over 70 models to choose from, featuring cooling powers ranging from 0.7 to 130kW, Huber’s Unistat technology is suitable for a variety of applications. The Unistat also provides professional scale-up, offering the same stable process conditions from development lab to production process. This ensures safety and stability without compromise. 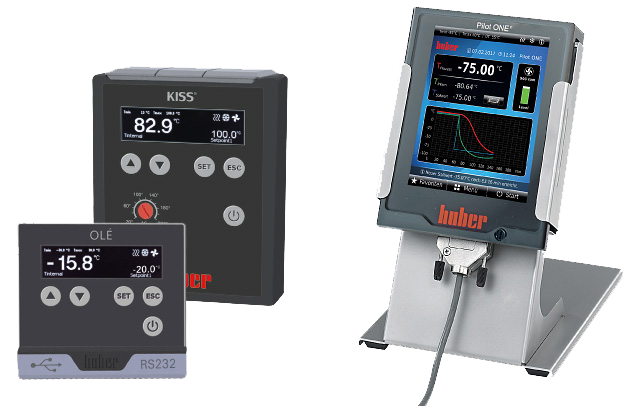 Huber’s circulators are split between the Compatible Control models and the simpler KISS models. Both product lines represent conventionally constructed laboratory circulators featuring open baths, with models for heating applications up to +300C, and for heating and cooling applications from -90C to +200C. 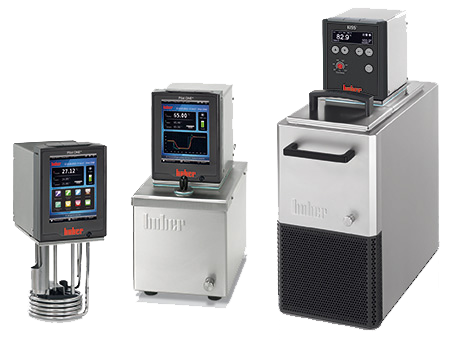 Huber’s immersion and bridge circulators are suitable for thermal control of existing baths, while the Ministat, the most compact cooling and heating circulator in the world, is the first choice for operation in fume-hoods and integration. Huber understands that many laboratory applications depend on a reliable source of cooling. 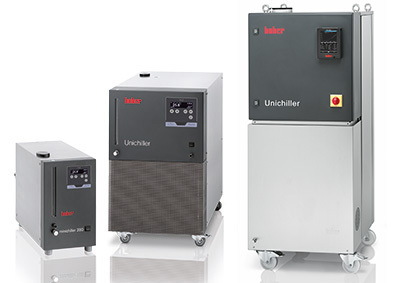 The Unichiller range of circulating chillers offer an ideal solution for environmentally-friendly, economic cooling in both laboratories and industry. Huber offer a choice of over 50 air and water-cooled models, with cooling powers ranging from 0.3 to 50kW. The efficient energy management found in all Huber chillers ensures low operating costs and reduced use of valuable fresh water, making Huber circulating chillers a resource-saving, cost-effective investment for process cooling for a variety of professional applications. All Huber’s accessories are designed to optimise the operation of existing Huber temperature control units and equipment. The highest quality materials and functionality tests ensure reliability and guarantee highly precise temperature control results. Huber’s range of accessories includes everything a professional laboratory needs to operate an array of temperature control systems. 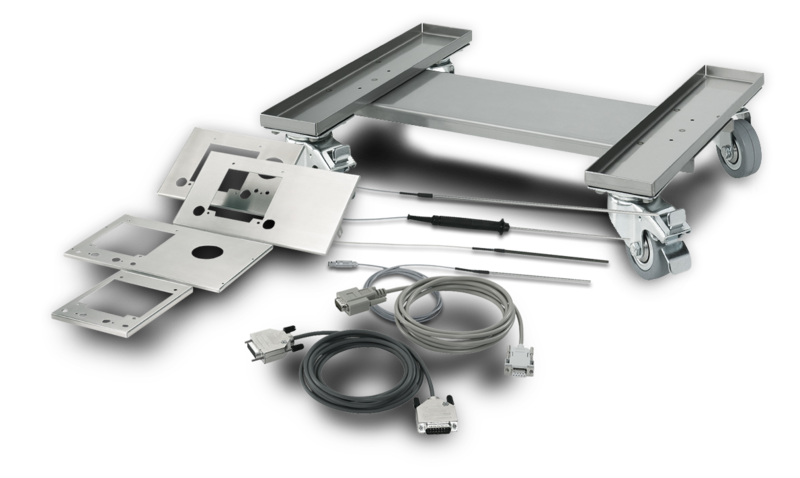 These include stainless steel baths, hoses, thermal fluids, adaptors, Pt100 sensors, software, interfaces and more.